Aether is a new way to think about performing massive simulations. Instead of having to worry about the fine details of communications between processes and machines in a cloud, HadeanOS takes care of the process communication, spawning, etc. and Aether maps processes to space. In this tutorial, we will show Aether in more detail, walking through a short demo. Firstly, if you haven’t already it may be a good idea to watch the bouncing balls demo video to give yourself some context. Great. 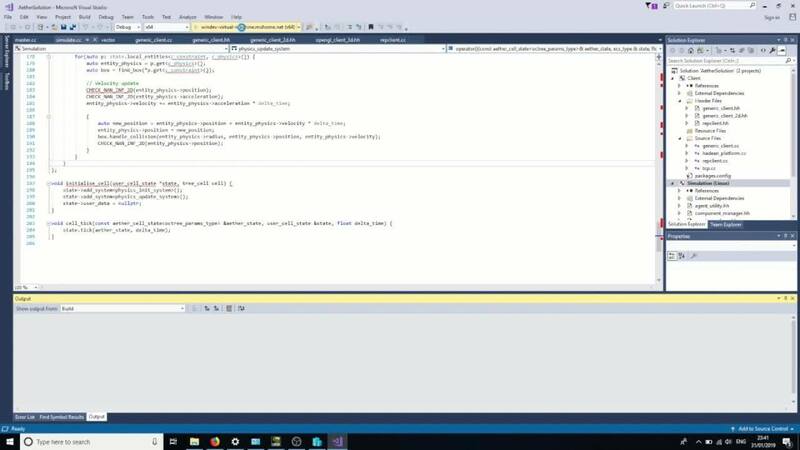 In the video, you can see there is an OpenGL client connected to the simulation, with our Aether plugin to receive data from and interact with the simulation, however we won’t worry about that aspect in this tutorial. Let’s talk about the simulation! In the window, you can see many agents bouncing about in a confined space. The cool thing about this is how little code has to be written, compared to other systems where communication is handled by the user. In Aether the user can choose sane default communications and extend or replace with their own if/when necessary. We’ll walk through it in more depth in a moment, but all you have to worry about as the developer is what the balls do when they reach the edge of the current space. That’s it. Everything more complex (handover, provisioning, spawning etc) is handled by calling into the Aether library. Aether maps space to processes, one to one or zero (so a process may exist for any point in the space). It has a hierarchical spatial encoding, which takes points in space from N dimensions to a 1D bit vector. The specific spatial encoding we use for this is an N dimensional morton coding. The advantages of this are laid out in a blog post here. But from the developer perspective, they don’t need to worry about this. They are provided with a simple, square space that they execute the simulation inside. If the simulation is agent based we provide functions for automatic handover etc. which make complex behaviours effortless to implement. For other kinds of simulation, e.g. fluid based, we provide all the functions for mapping any point to a single process, and any area to a set of processes, which can be easily communicated with using HadeanOS. Okay, let’s take a look at the code in manager.cc. I’ll continue from where the Hadean basics tutorial leaves off…COMING SOON. Here, we have a main function which is the entry point of the Aether Manager process, which becomes the managing process for Aether. As you can see, the developer writes the main tick loop, controlling the calls and timing (so they could also interact with some external systems here, eg. game marketplace). The simulation tick is invoked by octree.tick(). initialise_cell - run on each cell when it gets created (can be used to, for example, initialize ECS for each cell). initialise - used to initialise the simulation world, e.g. creating the world volume or the initial agents, run only on first worker (and after it’s cell is initialised). cell_tick - it’s the Aether Worker tick that should handle the simulation logic and is called over and over again whilst the simulation is running. First we create an Entity Component System (ECS) Update Set (ECS transaction), and add new entities to it. If you wish, you can read more about how to use our ECS in our ECS guide [COMING SOON]. Also it’s worth noting that Aether Engine already takes care of calling srandom, so you don’t need to call it. Here we initialise our local ECS with hand-rolled systems for physics (in a larger application this might use a physics library, such as PhysX or Havok). And the last bit - Worker tick - which here is very small; it just invokes the ECS tick. We use physics_init_system to initialise the variables which will be used in other systems. This demo doesn’t need to separate this, but in more complex scenarios you could have some other systems modifying the acceleration before physics_update_system. In physics_update_system we handle velocity and position changes of our local agents. We’ve built up quite a complex agent based simulation in very few lines of code. The complexity is dependant on the simulation, not on the state passing and management between processes.